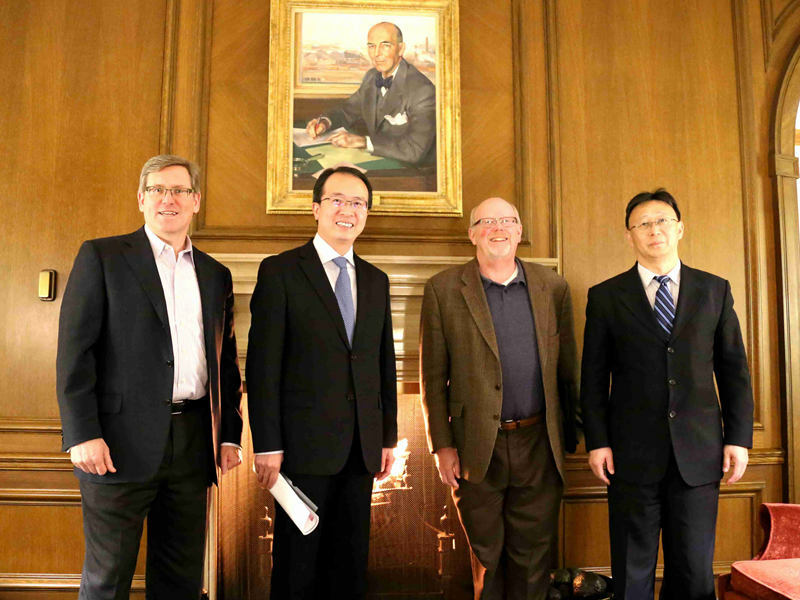 On April 11, Consul General Hong Lei visited two Fortune 500 companies Rockwell Automation and Briggs & Stratton Corporation, meeting with Tom O’Reily, Vice President of Global Business Development, John E.Lewis, Director of Business Partnering at Rockwell Automation, and Rick Carpenter, VP of Corporate Marketing, Timonthy Wild, VP of Global Supply Chain and Donald Kelenk, VP of Operations at Briggs & Stratton Corporation. During the visits, Consul General Hong Lei said that the two companies’ successful operation in China shows that China and America enjoy vast potential for cooperation. As long as the two sides adhere to mutual respect and win-win cooperation, companies and people of both sides will enjoy great benefits. Currently, China’s economy has remained stable growth with a moderate speed. Reform is being deepened, market is widely opened, and the environment for investment and business operation becomes increasingly better. This has brought enormous business opportunities to companies of America and the whole world. In November this year, China will host the first International Import Expo in Shanghai, an important move taken by the Chinese Government to support free trade and economic globalization and open its market wider to the world, which will create great opportunities for companies of all countries including America. American companies are welcome to participate in the expo. Vice President O’Reily said that Rockwell Automation began operation in China in 1988. For the past 30 years, the company has deeply merged with the Chinese market with its products accounting for 33% of the Chinese market. The company now has two R & D centers, three logistics centers and over 100 partners in China, hiring over 2,000 Chinese employees. The company is dedicated to further developing the Chinese market, wishing that the US-China trade relations can develop smoothly to create a sound environment for economic cooperation. 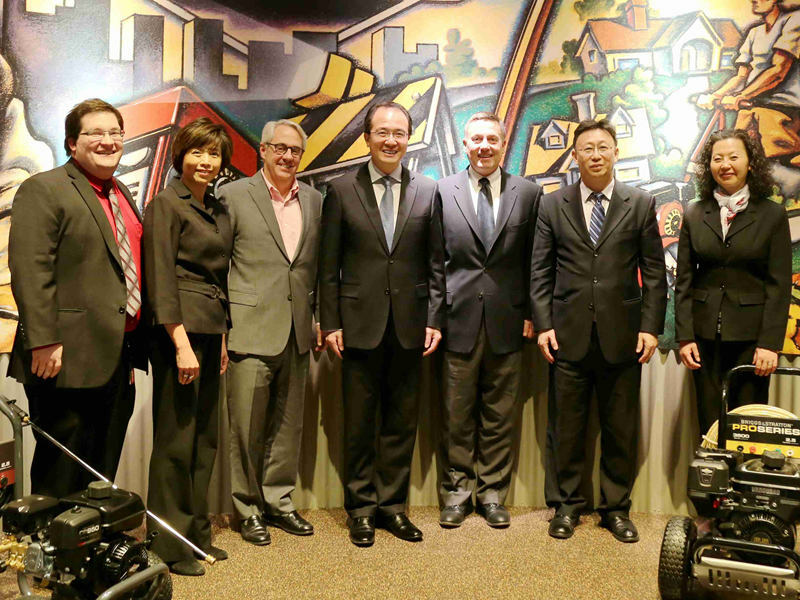 Vice President Carpenter said that Briggs & Stratton Corporation’s business in China has been developing rapidly. In 2017, the company’s revenue from China reached 12.5 million US dollars. The company has factories in eight Chinese provinces and municipalities including Jiangsu, Anhui, Guangdong and Shanghai. He said that with years of development, operations in China have become an important part in the company’s international industrial chain. Healthy and stable US-China relations are of vital importance to the company’s future development. 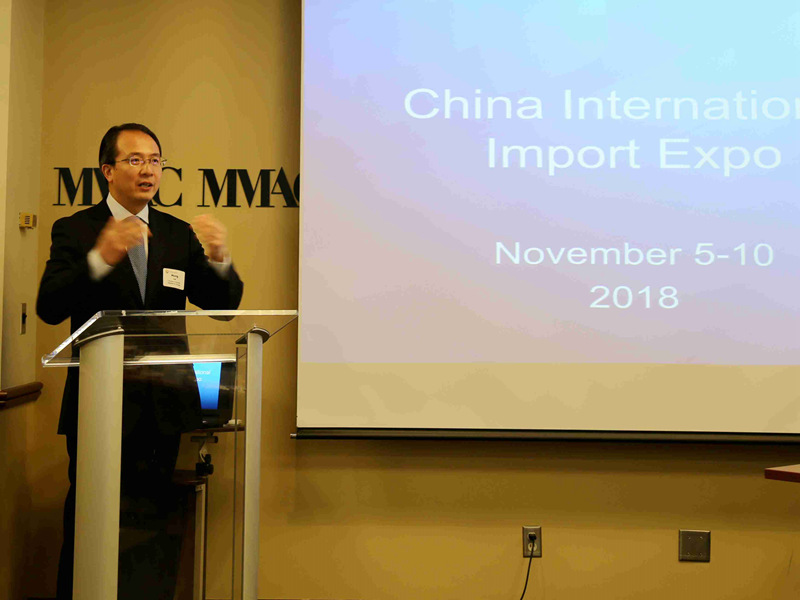 In the speech delivered at the World Trade Association in Milwaukee, Consul General Hong Lei said that the stable and healthy China-US relations not only have great impact on the core interests of the two peoples, but also play an important role in the world economic development. The US 301 investigation is a typical unilateral and protectionist move, violating WTO’s rules, breaking America’s own promises, putting the international multilateral trade system at risk, and hurting both China and America’s interests. China strongly opposes such investigation. Consul General Hong Lei said that the year 2018 marks the 40th anniversary of China’s opening up. At the Boao Forum for Asia, President Xi Jinping announced to significantly broaden market access, create more attractive environment for investment, enhance intellectual property rights protection, and take the initiative to expand imports. These moves demonstrate Chinese government’s determination to opening up. China’s door of opening-up will not be closed and will only be even wider. Consul General Hong Lei hopes that companies in Wisconsin could seize the new opportunities in China’s opening up and realize win-win development and mutual benefits with China.